h09_11, originally uploaded by La Vita Moderna. white bedroom with minimal style. few furniture in the room. h09_9, originally uploaded by La Vita Moderna. The family room with famous chairs. The "Barcelona Chair" by Mies van der Rohe. 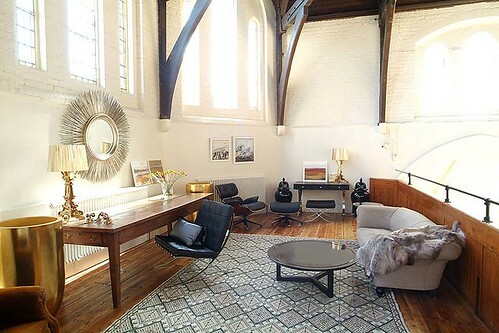 Charles and Ray Eames Lounge Chair and Ottoman. ci_livingroom.jpg, originally uploaded by plastolux. libby langdon bedroom, originally uploaded by coco+kelley. Bedroom, originally uploaded by sunshinesyrie. 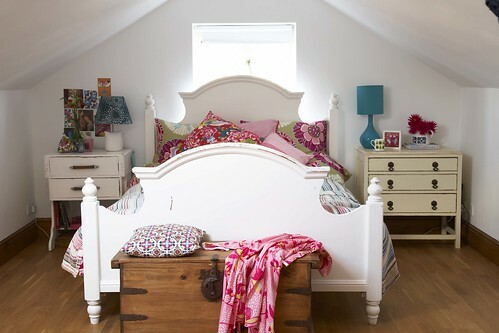 A childs dream bedroom found on the internet. Glam Room, originally uploaded by champagne.chic. This bold and glamorous room was painted in a deep lilac with black trim and lots of sparkle and glitz. (Cue "Purple Rain" here) I had the ceiling bumped out to accommodate some theater-style drapes that highlighted the chandelier and bed. Two clear Louis Ghost chairs sit by the window- carefully NOT blocking the great view of the neighborhood! black bedroom, originally uploaded by mkthlmc. 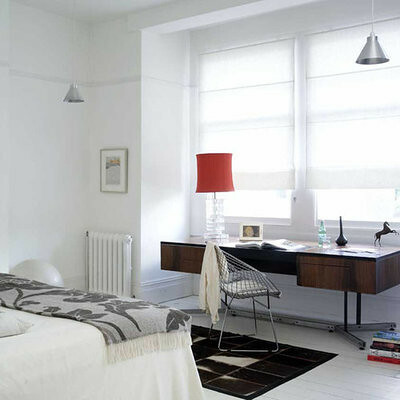 Ideas for small spaces: White curtains + faux paneling + modern fabric + tidy storage, originally uploaded by xJavierx. 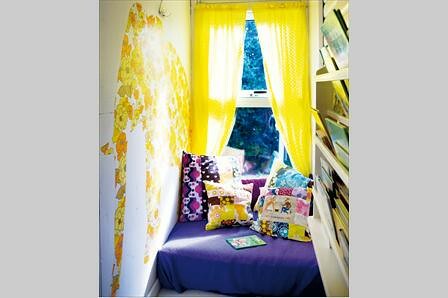 The tiny and fabulous Manhattan apartment of Michelle Adams, a former domino magazine stylist and the mastermind behind the eco-friendly Rubie Green fabric range. Adams' decor was inspired by the JK Capri Hotel in Italy. The small living room is outfitted with fabrics from her line; she found the rug and bamboo chair at outlet stores. The bamboo chair seat (right) is upholstered in Rubie Green's 'Mary' fabric; the wing chair (left) is Rubie Green's 'East Village' print. 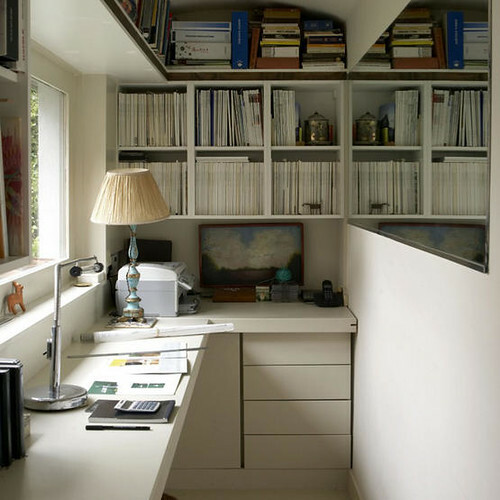 The 'Lack' bookcase and cotton curtains are from IKEA. 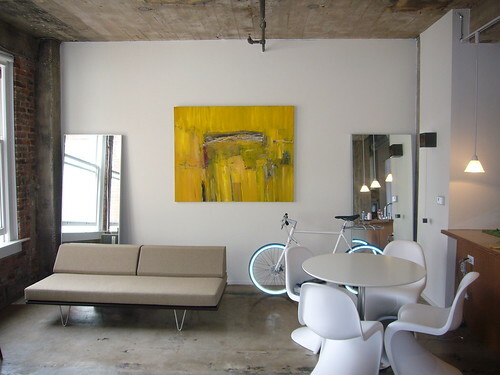 Photo by Patrick Cline, Real Living (Australia), July 2009.
modern loft, originally uploaded by modliving. Loft reflected the industrial age which is presented by the material,structure with less cosmetics. hus & hem, originally uploaded by frillie designs. 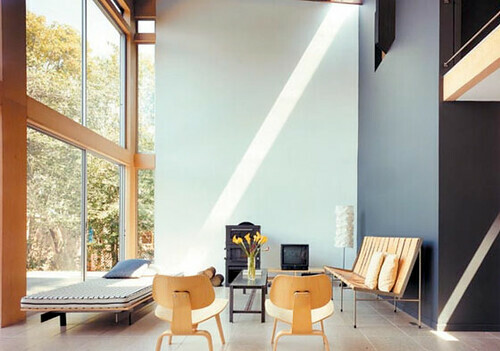 Mid-century modern living room: Jens Risom loveseat + Benjamin Moore 'Seed Pearl,' from Met Home, originally uploaded by xJavierx. In this eco-friendly Dallas living room, walls are painted Seed Pearl by Benjamin Moore. Vintage 1950s leather Katavolos/Littell/Kelley chairs, purchased at Collage Classics (collageclassics.com), face a vintage ‘50s Jens Risom love seat (found at a resale shop). The coffee table is from West Elm. 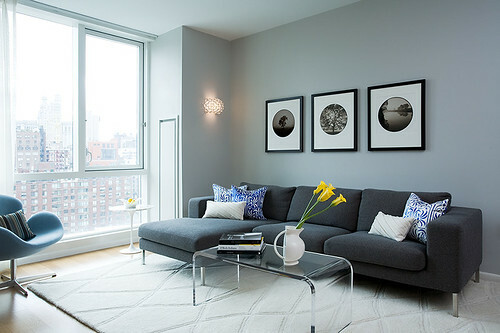 The rug is from the Shibui Collection that homeowner Julie Cohn designed for Surya (surya.com). Photo by Jack Thompson, Metropolitan Home, April 2009. 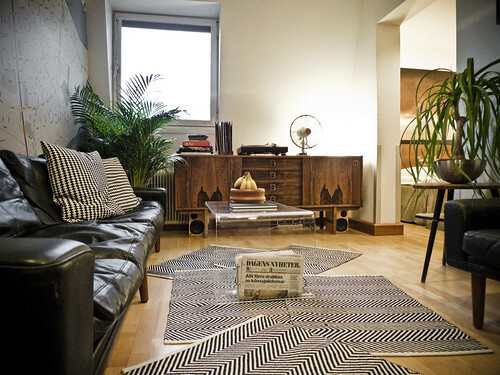 Ideas for small spaces: Earth tones + modern stripes + Farrow & Ball's 'Lime White', originally uploaded by xJavierx. Cozy and calm, but also cheerful -- just what you need in a small bedroom. Walls are painted Farrow & Ball's Lime White. The striped curtains, from Roger Oates design, add a modern punch to the earthy elements in the room. 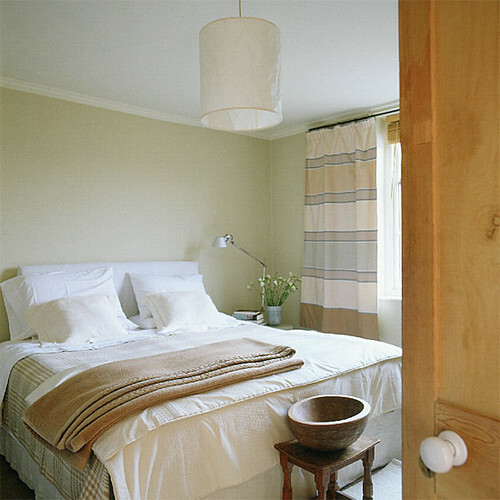 Photo from housetohome.co.uk, first published in Ideal Home, March 2005. Mood Board Creation, originally uploaded by gyrlapple. modern girls room interior, originally uploaded by masminto354. loft kitchen oak cabinet as counter top, originally uploaded by ooh_food. gemma1, originally uploaded by La Vita Moderna. 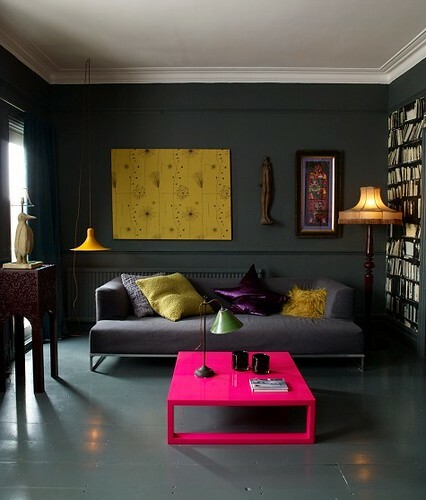 Modern living room in grey with pink accent. My bedroom.., originally uploaded by frillie designs. 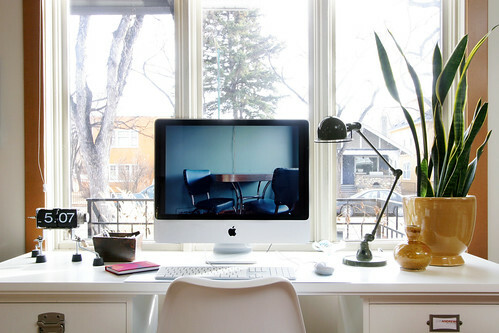 modern-home-accessories, originally uploaded by masminto354. Modern Home - Roger Hirsch, originally uploaded by plastolux. Living room with double space. It links between inside and outside by big window glass. 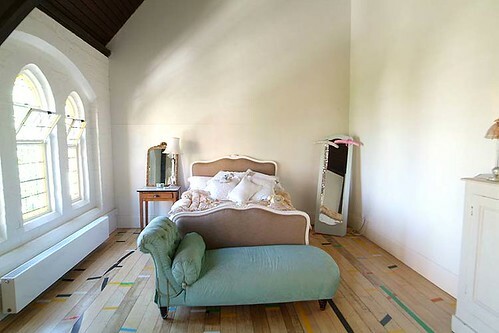 White bedroom via Apartment Therapy, originally uploaded by Lyndar T. Merciless. Classic and vintage bedroom in white. Baroque frame shelves via Apartment Therapy, originally uploaded by Lyndar T. Merciless. Baroque frame shelves via Apartment Therapy. Good idea for wall decoration. Pink + blue living room: Retro Los Angeles glam by Joe Nye, originally uploaded by xJavierx. Another view of the raspberry-turquoise L.A. living room, designed by Joe Nye. 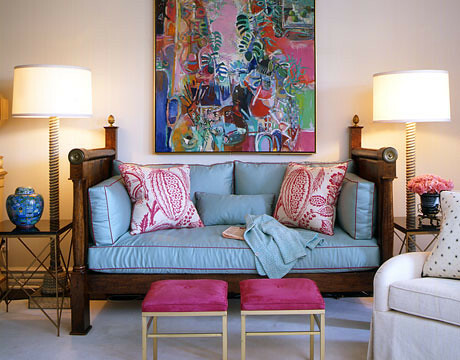 The French Directoire antique mahogany daybed is covered in Danby Aqua cotton by Robert Allen and is welted in Lee Jofa's Crescendo Suede in rosetta; its fuchsia and white pillows are Pali Garance, an iconic Manuel Canovas print. 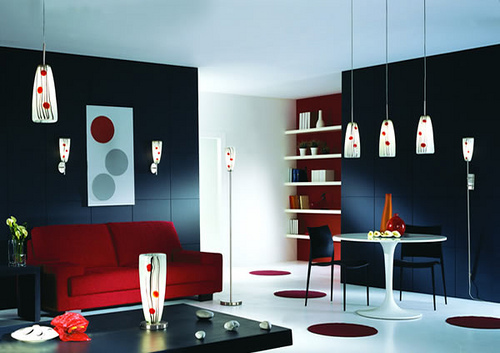 Floor lamps from Downtown. Painting over daybed by Robert Frame. Photo by John Coolidge, House Beautiful. Lovely blue bedroom: Benjamin Moore 'Woodlawn Blue' + embroidered silk duvet, originally uploaded by xJavierx. Like waking up in a pool! In this New Orleans bedroom designed by Hal Williamson, walls are painted Woodlawn Blue by Benjamin Moore. Duvet and sham fabric is 'Guinevere Silk' in blue/aqua by Lee Jofa. Headboard from Kisabeth Furniture, upholstered in 'Ajmer' silk in jade from Libas Limited. Bench from Maison de Provence, upholstered in '180619H' in blue ice by Highland Court/Duralee. Chair upholstered in 'Silk Rib Stripe' in spa by Kravet. Mirrors from Sentimento Antiques. Photo by John Kernick, House Beautiful, October 2008. 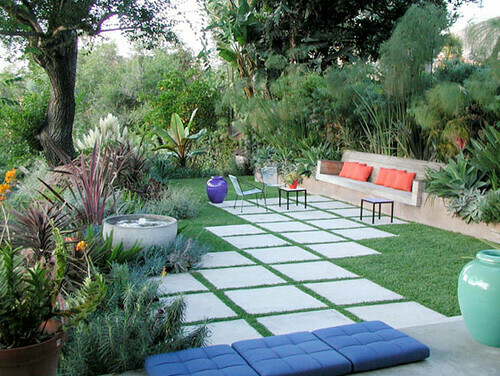 Modern Landscaping - Elysian Landscapes, originally uploaded by plastolux. Pink kitchen from Colin & Justin's Home Heist, originally uploaded by Lyndar T. Merciless. Sweet color in your kitchen. Pink + brown in modern foyer: Benjamin Moore 'Bittersweet Chocolate', originally uploaded by xJavierx. Mmm, chocolate. 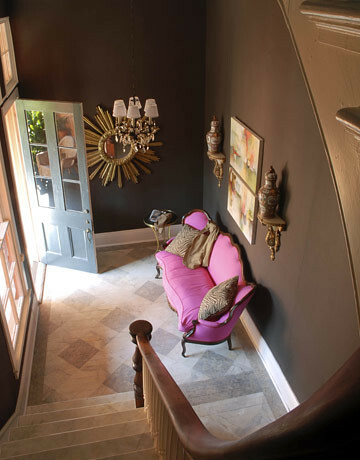 In this New Orleans foyer designed by Ned Marshall, walls are painted Bittersweet Chocolate by Benjamin Moore. Portuguese Victorian sofa covered in Schiaparelli pink linen. "The Portuguese always imitated English furniture, but they did it in such an exuberant way that it's really over-the-top," says Marshall. "Sort of like what the Italians do with French furniture." Photo by Kerri McCaffety, House Beautiful, May 2009.
ny spaces living room, originally uploaded by coco+kelley. Modern Apartment For Sale, originally uploaded by plastolux. 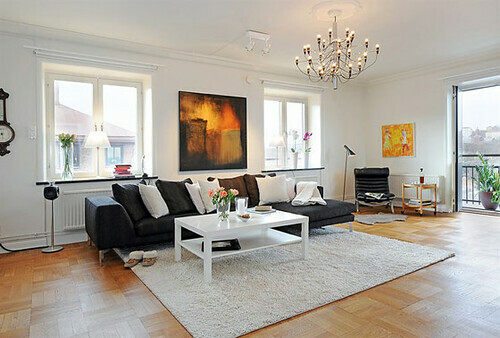 One room living with white color. The #3 House, originally uploaded by Stebbi. 22, originally uploaded by captainqueen1125. bwliving, originally uploaded by yumayummymommy. living etc. bedroom, originally uploaded by frillie designs. 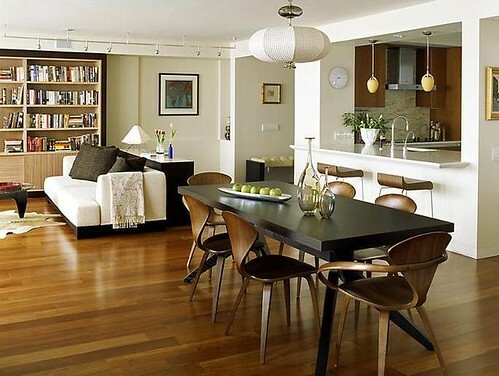 Modern, open-plan living: Norman Cherner chairs + Noguchi coffee table, originally uploaded by xJavierx. 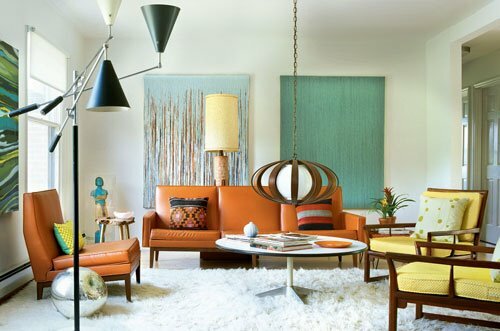 Mmm, love those Norman Cherner chairs. 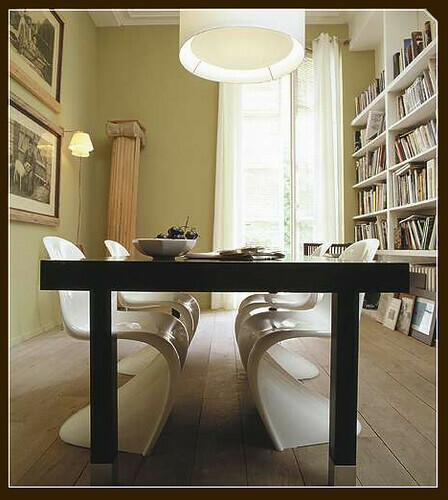 And I'm not certain, but that table looks a lot like a Matthew Hilton Cross Extension Table. Fort Lee, New Jersey residence deigned by Peter Pawlak; photo from www.peterpawlak.com. Bedroom, originally uploaded by plastolux. Dream Home-Didier Gomez2, originally uploaded by Carolina Eclectic. blue interiors, originally uploaded by ooh_food. How to use blue color in your home. A natural color, from the blue of the sky or water, blue is a universal color. The cool, calming effect of blue makes time pass more quickly and it can help you sleep. Blue is a good color for bedrooms. However, too much blue could dampen spirits. Modern Home - Assembledge, originally uploaded by plastolux. I like the modern design. 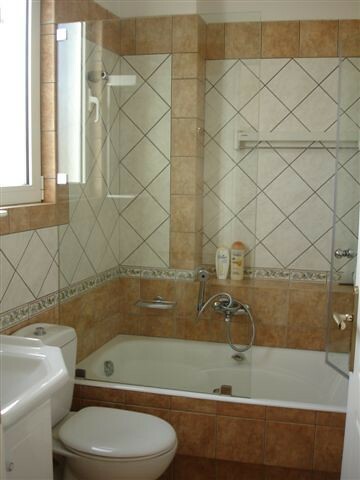 Modern bath with glass enclosed shower, originally uploaded by greek58. Living Room, originally uploaded by susankennedydesign. monday- worked hard, originally uploaded by The 10 cent designer. traditional with a tangerine twist, originally uploaded by The 10 cent designer. 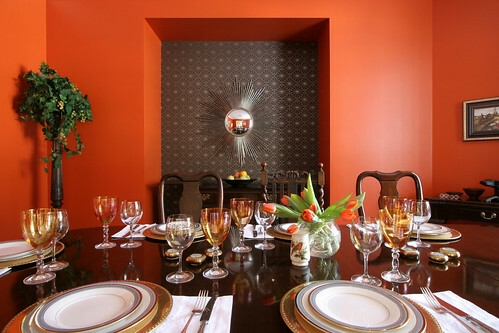 my second mum had painted her dining room this fantastic shade of orange but was unsure of her choice. so I sold her on this wallpaper and I brought her the yummy starburst mirror. voila! traditional never looked so delicious. green glass bathroom, originally uploaded by ooh_food.